A gentleman approached me at a craft show and asked if I could do a custom coin display for a friend. He brought me the coins and I inset them into a piece of walnut flooring I got from an elderly woodworker who was closing his shop. I’ve never done a custom coin shape other than round so I did a prototype with his coins and a couple of mine to figure out the best method. Forstner bit for rough inset finished with a dremel router. The round coin is inset into blue felt. The other two coins are inset directly into the wood (pressed in by hand). Finish is hand rubbed 2#shellac polished on the Beall Buff. Appreciate any comments, critiques, or suggestions. I think you did a GREAT job of getting the items beautifully displayed! That is an impressive project – well done my friend. These look really well done Pete. Your customer should be very happy with them. I have a few RAN (Royal Australian Navy) Plaques hidden away in my garage gathering dust. Your post prompted me to ask the question, let me know and I can take some pictures if of interest. A very impressive process to mount the shields/coins, I would be interested in just how you did it. Rob, would love to see the pictures. 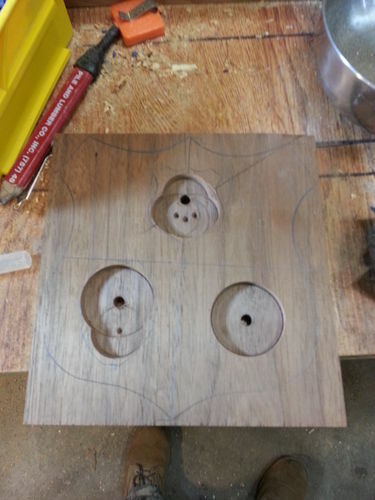 I traced around each coin and then rough drilled the holes with a forstner bit. Note the 1/4” holes go all the way through so the coins can be pushed out if necessary. Then I used a dremel tool in a router attachment with a 1/8” spiral upcut bit to cut away to the pencil lines. There was a lot of carve, check fit, carve some more until I got the holes just big enough to press the coins in. There was also a far bit of strong language as the bit kept vibrating down in the chuck, but the extra depth isn’t noticed behind the coin.